I had a really nice slingshot as a kid. Not a Y-shaped stick with a rubber band on it, but a seriously legit metal slingshot with an arm brace and everything. But it had nothing on the Assolar SS-12, which I just saw on The Gadgeteer. 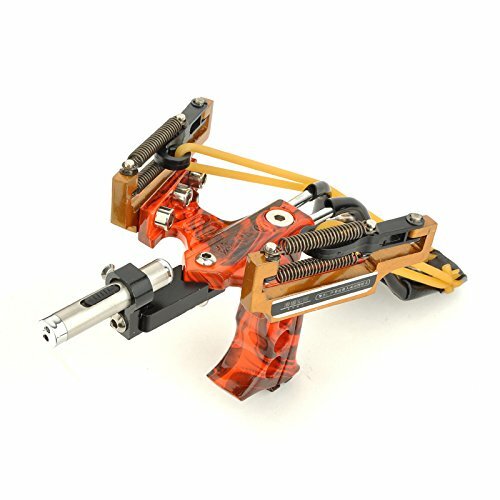 Officially listed on Amazon as the “Assolar SS-12 Multi-function Super Power Stainless Hunting Laser Slingshot, Hunting Bow with Adjustable Spring and Quality Rubber Bands,” this slingshot has a spring mechanism to amp up the power of your shots, a laser for aiming, and an included attachment to turn the slingshot into an arrow launcher. I have no idea if this is the best $85 slingshot on the market, but I do know I want one. Amazon is full of bizarre slingshots with more attachments and accessories than a high-end camera rig. Like the “Yancorp Powerful Hunting Slingshot with Arrow Knock, Wrist Support, 4 Sets Rubber Bands, Flash Light,” and the wide variety of fishing slingshots that have a built-in reel. I have no desire to go hunting or fishing — or really to leave the house at all — but I feel like one of these sweet slingshots would definitely make 12-year-old Paul the coolest kid in the neighborhood.